You can also see her persistent but smart begging (humans can't get to the fridge without her knowledge). I've often thought this lazy pose resembles the athletic pose gymnasts strike on the balance beam where they use their core strength to lift themselves up with their legs out. 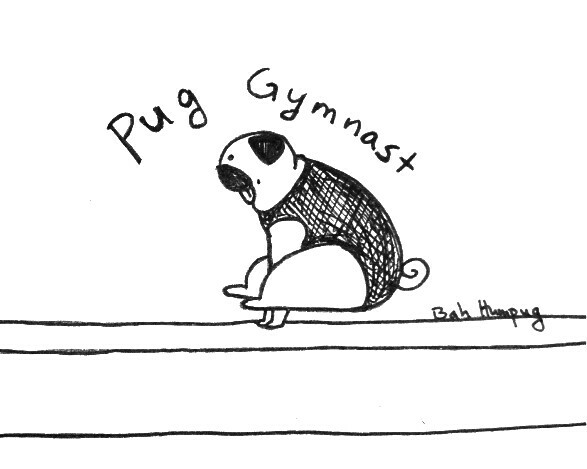 So here's a gymnast pug using her core strength (hahaha! Pugs and core strength in the same sentence??) on the balance beam. 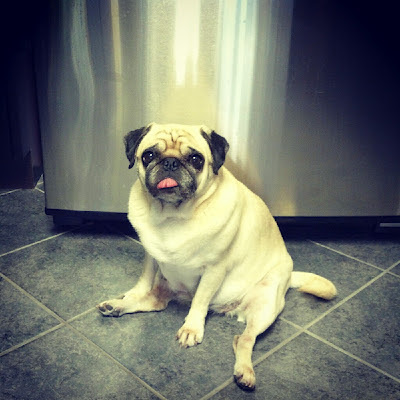 My blind pug slumps in front of the cable box so i can't change the channel until I do what she wants. I have no clue how she knows where to sit but she does. Haha it's pugs' secret power! They don't need sight to know how to manipulate us into doing what they want! We have always called this pose "sitting like a fat lady without her corset"!